Two periods of seven days with the middle day falling on the spring or autumn equinox are called Higan(彼岸), which means "the other shore" or Buddhahood. On the other side of a river, there is Buddhist paradise and we live in the world of suffering on this side of the river(此岸). Higan started on September 20th and will end on 26th this year. It is usually cool during the period, but it was very hot on 22th this year. I have the anniversary of my father's death during higan in autumn. I visited my family grave with my family. With temperatures dropping quickly, I caught a cold. Kakochou(過去帳) is a family register of deaths that contains the deceased's posthumous Buddhist name, secular name, date of death and age at death. The register has two facing pages per day. High priests' names, year and month of death are written at the top of a page. We write those of the deceased at the bottom. The history of my family dates back over 200 years in this register. 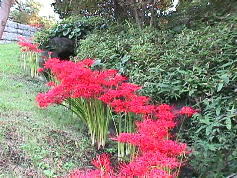 Starting to bloom during higan in autumn is responsible for its name. 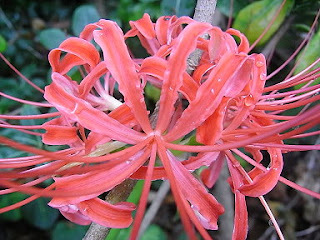 It is regarded as an ominous flower in Japan. It is also known as Manjushage(曼珠沙華) that derives from Buddhist scriptures. The bulbs of spider lily are very poisonous, but immersing them in the water can detoxify their toxicity. (It's too dangerous to do it actually.) So it is said that they used to be planted to save people from starvation. Some people say they are used to surround their paddies and cemeteries to keep the mole and mice away and were planted around the cemetery for ancestors' soul. Spider lilies blooming in front of a vending machine. It's kind of odd. "Autumn breeze, she wanted to pluck, these red flowers," written by Kobayashi Issa(1763-1828) in "Oraga Haru(My Spring)". Issa came from a troubled family background. At the age of 56, he had his first daughter. However, she died due to smallpox shortly after reaching her 1st birthday. He visited her grave after on the 35th days after her death, the 25th day of the 7th month in the lunar calendar(September 14th in the Gregorian calendar). 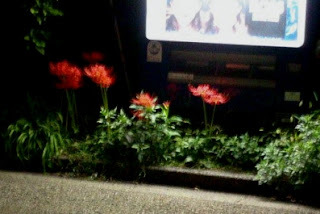 Then he saught red flowers swaying in the autumn wind. Those are the flowers that she was avid to pluck. 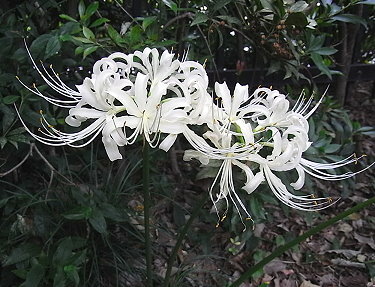 We don't know what kind of flowers those were, but I think that spider lily is appropriate for this haiku poem.